What do you think of this Apron Cooking Guide? Everything you need to cook up a storm in your kitchen! Protect yourself from kitchen splashes and messy hands whilst having tons of useful information literally at your fingertips. 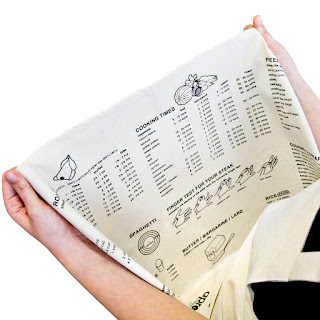 With this handy apron, you needn't get the cook books dirty and stained, just look down and you will see everything you need - numeric conversions, cooking times for vegetables, roasting times for birds, freezing instructions, defrosting times, a cooking glossary and even more! Practical in dozens of ways, this Apron Cooking Guide is a must have accessory for any kitchen and a wonderful gift for any recipe enthusiast! BONUS QUESTION! Who has the best price? Today it is definitely the US Amazon site at 30% off!